Incredible effects, and lots of 'em. Terrific fun with MIDI control. Some unique sounds. Lots of presets. Randomise function. Incomplete manual. Tricky to recreate specific effects. Guitar amp is mono-only. For some years now we've had access to glitch plug-ins that offer more sonic madness within ten seconds of firing them up than could be achieved with ten hours of manual tweaking. Unlike other established effects, though, there are no particular expectations of how any given glitch plug-in ought to work. 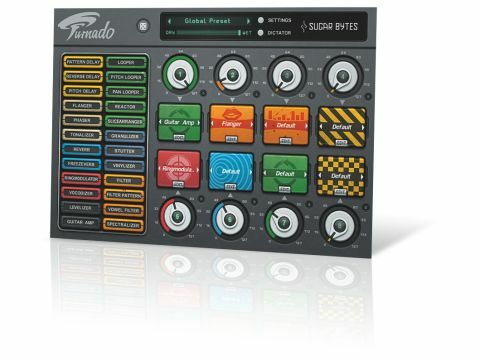 Turnado is Sugar Bytes' latest take on the concept: it's a VST/AU plug-in and standalone app centred on eight one-knob effects chosen from a palette of 24. "With the Dictator feature, you can precisely determine the setting of each knob at any point of the Dictator slider's travel." When a knob is turned right down, the effect is off; turning it up engages and then increases its effect. You can also access an editing screen to determine which parameters a knob controls, and by how much. There are even response curves, so increasing the knob doesn't necessarily result in a linear increase of the parameters it controls. You'll also find two LFOs and an envelope-follower. A feature dubbed Dictator allows control of all eight knobs at once. It features an editing panel where you can precisely determine the setting of each knob at any point of the Dictator slider's travel, and is flexible yet intuitive. Each effect offers a good number of presets, and there are global and Dictator presets too. One of our favourite features is the randomise function for creating brand new global presets at the touch of a button. It's hard to overstate how awesome this is - we didn't get a single randomised preset we didn't like. Running as a standalone app, Turnado is ideal for using as part of a DJing or other live setup, and is completely rock solid. As an insert effect, it serves up huge doses of powerful glitchy edits. Get hands-on with MIDI control in your DAW and you reach a sort of middle ground, allowing real-time but easily editable mayhem. As great as the plug-in is, the manual feels a little thin. There aren't nearly enough practical tips and walkthroughs for using Turnado in real-world projects. This is a deceptively versatile and powerful plug-in, and it rewards experience and a subtle touch. Without practical advice, we fear too many users will either get frustrated or fail to scratch the surface. On a related note, even an experienced user can spend too long trying to recreate or capture a particularly cool-sounding effect and still not always succeed. We think Turnado needs some way to store its audio output - say for ten or 20 seconds - so that at any point you could just hit stop on your sequencer and export the contents of the buffer as a wave file. As it is, you lose too much of that fleeting good stuff. It's infuriating! Turnado probably isn't for everybody. It's great for adding glitchy interest to individual parts or full mixes; and as a live effects processor, its ratio of power to simplicity is arguably unrivalled. But the effects are often extreme, soif that's not your bag, then £120 is a big investment for something you'll no doubt enjoy but might rarely use. That said, the effects are truly top notch, so you could even ignore the performance aspect and use Turnado as a conventional processor - even pedal-loving guitarists would get a lot out of it. We could devote several web pages to the effects on offer in Turnado, but some deserve special mention. We love Reactor, which is a looper that's triggered by transients, and the Slice Looper always seems to give fantastically musical and funky results. Other gems run the gamut from vocoding and pitched looping to frozen reverb and formant filtering. They're amazingly consistent, hugely varied and include a few genuinely new effects. There are plenty of clever little touches, too, like the ability to have the effects routed either in numeric order or the order in which you engage them. Crafty! There are some slightly controversial decisions to be found, however, like making the guitar amp effect realistically mono. It can sound cool in conjunction with fast modulation or Dictator setups for mono-to-stereo swapping, but a stereo option would have been nice, as any subsequent effects will be fed the mono signal too. Throw in those performance features and this really is a stunning plug-in. If you'd like to treat yourself, then we recommend spending an idle afternoon playing with the demo. Just don't expect to get much else done that day.